For centuries, dentures and dental bridges were the best solutions to replace teeth that were missing or failing. Today, though, dental implants have become the treatment of choice. They are strong, durable, and secure, and they can halt or even reverse jawbone loss. 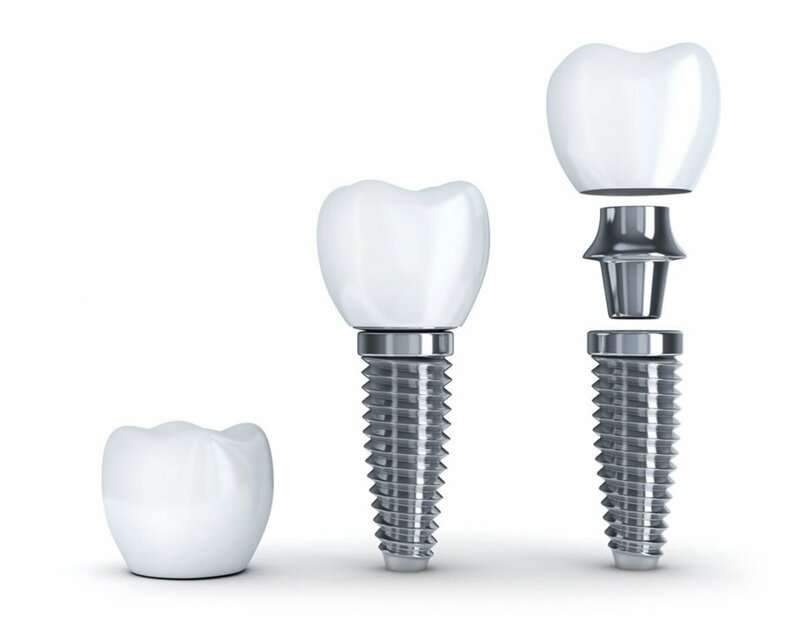 A single dental implant can support one crown, while just a handful of implants can secure a full, fixed arch of high quality replacement teeth. Whichever procedure is right for you, the basic process of placing dental implants remains the same. The first step is a thorough assessment of your teeth, bone structure, and soft tissues. Using x-rays and digital scans, we can determine whether dental implants are the right choice for you. We will then work with you to develop a complete treatment plan that fits your budget and your goals for treatment. We can only place dental implants in a clean, healthy mouth. Therefore, we must correct any dental problems such as gum disease or tooth decay. When your mouth is clean, we will extract your failing teeth under local anesthesia. We can place an immediate denture so that you are not without teeth during the healing process. Although it is not common, some people lack sufficient jawbone for dental implants. In this case, we will complete a simple bone grafting procedure. The grafts will need to heal for several weeks before we proceed. Placing dental implants is a minor oral surgery. After thoroughly numbing your mouth, we will cut a small flap in your gums, and then use a series of drills to open a tiny, precise hole in your jawbone. We will screw the biocompatible titanium dental implant into the opening, cover it with a healing cap or cover screw, and close your gums. If you need multiple dental implants, we can place them all at once. You will continue to wear your temporary partial or full denture for several weeks while the implant fuses with your jawbone. When your implant is fused with your bone, you will return to our office for a simple procedure. We will remove the healing cap or cover screw, replace it with an abutment, and carefully attach your final crown, bridge, or other restoration. If you need to replace all of the teeth on your upper or lower arch, the All-on-Four is a unique immediate load implant solution. Rather than wearing a temporary denture while your implants fuse with the bone, you can leave our office the same day as your implant surgery with a full, fixed arch of lightweight teeth. After the implants fuse, we can replace the teeth with higher quality porcelain if desired. However, many people find that the initial teeth work just fine for the long run. If you’re ready to start your dental journey with a caring and compassionate dental team in Aurora, Ohio, contact Aurora Dental today at 330-562-3400 to schedule your first appointment.